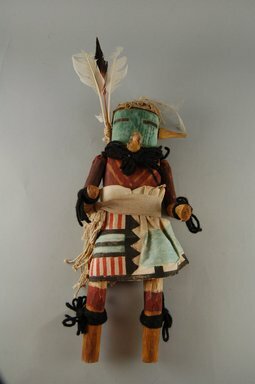 This Kachina has a red painted chest. His mask is helmet style, blue, with black slit eyes and a pointed snout nose. The PR side has a feather attached, the PL side a paper cone. He wears a painted cloth skirt, yarn ties around wrists and calves. He is missing feet. The back of the helmet style mask has a multi-colored dragon fly design and the back of his chest has a painted, narrow, yellow V stripe.